I was a 13 year old comic book reader when the birth of Marvel Comics launched the Silver Age of Comics in the early 1960s. That’s why writer/editor Stan Lee, after family and teachers, has had more of affect on my life than anyone else in this world. 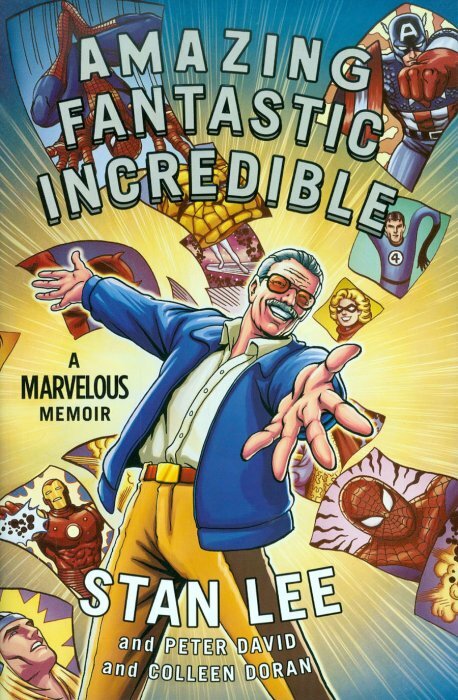 Through his innovative changes to the media writing imperfect heroes with problems, he elevated the storytelling in comics and for the first time made them appealing to adults. It is no small wonder that I grew up wanting to be a comic creator. So yes, Stan Lee is one of my personal heroes and reviewing a graphic novel autobiography required a bit of distancing on my part. What you have here is a one man’s story of what happened from his early days as a youngster in New York City to his becoming one of the most recognizable cultural celebrities in the world. As with all such autobiographies, all we can rely on is his version and in that regards some of the stories concerning his conflicts with other well known comic personalities is to some degree suspect. In all such incidents we understand there was another side and yet Lee doesn’t shy away from those awkward events that were painful to him and his family. To his credit, he goes out of his way to credit people like Jack Kirby, Steve Ditko and all the other amazing creators who built Marvel Comics. I was personally touched with his tribute to his own younger brother, Larry Leiber. And whether you choose to believe his narrative completely or not, there is no escaping the fact that Stan Lee knows HOW to tell a story. Which is the part of this volume we can address with unabashed praise. The art by Colleen Doran is magnificent throughout and finds her adjusting her style from realistic depictions of actual people to outlandish cartoony figures when depicting one of Lee’s many wacky anecdotes. Kudos also go to Peter David, one of the finest comic scribes in the business. I have to believe he is partly responsible for taking Lee’s wandering reverie and shaping it into a linear tale with a beginning, middle and end. This book is a gem and for this veteran Marvelite, a treasure. It was given to me by my family for Christmas. They obviously know that within this aged body there still resides an eager, excitable 13 year old who so enjoyed this trip back to a much happier time. As Lee would say, Excelsior!! Rare are the times when a reviewer so loves a book that he or she has to share it with close friends and family, never mind their reading audience. Such was the case years ago when we first read John Scalzi sci-fi actioner “Old Man’s War.” We hadn’t been that excited about a science fiction novel since the days of Asimov and Heinlein. Thankfully that book was only the first in a series and subsequent titles set in that universe soon followed. All of them were exceptional and much fun. Scalzi is a skilled writer with a gift for creating endearing characters. Now we have “The Human Division,” the latest in this series centered about the super military organization of earthlings known as the Colonial Defense Union. In the distant future, mankind has ventured into the stars only to discover they are populated with thousands of alien races, some friendly, others not so. To survive these encounters, humans create super soldiers, i.e. new scientifically enhanced bodies capable of withstanding harsh environments and going toe to toe with hostile aliens. These bodies are then offered to the Earth’s senior population; men and women in the twilight days of their lives. All they have to do is pledge ten years of service to the CDU and they’re consciousness is implanted into one of these green super bodies. Thus someone nearing death is given a second chance at life. That’s the basic set-up. In this latest entry, a schism between the Earth and the CDU has materialized when it became clear to the governments of Earth that the CDU was basically using the planet’s over population as a breeding pool for their armies; an ugly truth that, when shown in such a harsh light, didn’t sit well with various Earth governments. Earth has broken off relationships with the CDU prohibiting any further seniors from leaving. Then to add more headaches to the beleaguered CDU, a confederation of alien races calling itself the Conclave, begins overtures to recruit the Earth into their organization thus effectively separate it politically from the CDU. As the book opens, members of the CDU’s diplomatic corps are tasked with smoothing over the Earth’s ruffled feathers and re-establishing a viable alliance between the CDU and its mother world. Without warning terrorist attacks are launched against both CDU envoys and Conclave diplomats. A mysterious third party has entered the game and is doing its best to start a war between the two space faring groups. Caught in this topsy-turvy chaotic mess is the crew of the CDU Ambassador ship Clarke led by Ambassador Abumwe and captained by Sophia Coloma. Among the ambassador’s retinue are diplomatic assistant Hart Schmidt and CDU Tech Lt. Harry Wilson. 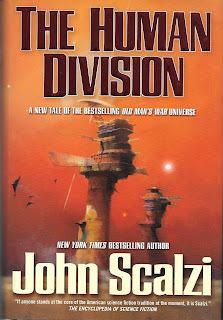 They are the book’s central cast and Scalzi tells his story via a series of interconnected short stories brilliantly wet forth; each building to the climatic finale. “The Human Division,” recaptures the wonder and excitement of “Old Man’s War,” but on a grander scale and certainly left this reviewer wanting the next installment soon. This is old fashion sci-fi done right and we certainly need a whole lot more of that these days. Okay, we’ve still got time to review a final holiday children’s book that landed on our desk a few days ago. 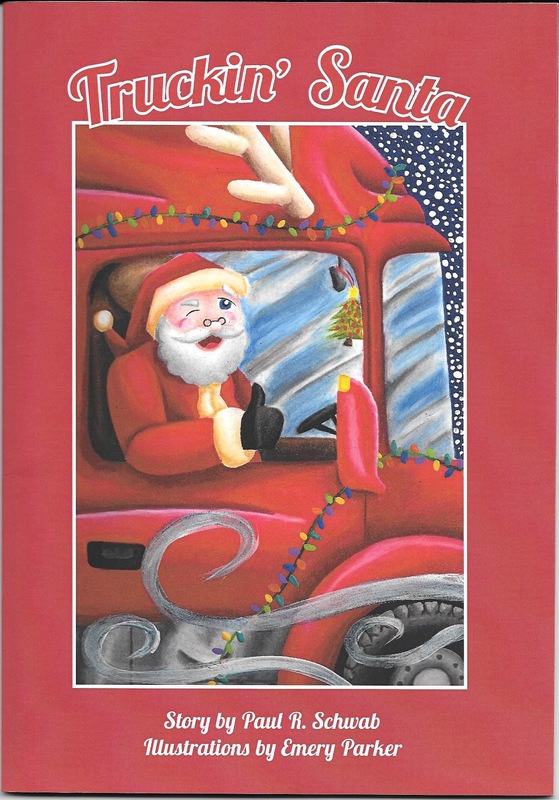 “Truckin’ Santa,” by Paul R. Schwab is a really fun story about how Santa Claus, his elf assistants and reindeer team end up stranded on the side of a country road in the middle of an horrendous blizzard on Christmas. With steadily falling snow making Santa’s sleigh too heavy to fly, he is grounded with almost half his toy deliveries yet to be made. It sure looks like Christmas is going to be a bust. Then, after offering up a Christmas prayer to Lord of Peace, Santa and his friends see a huge 18 wheeler rig come lumbering down the road driven by a trucker named Nebraska Sam on his way home to spend Christmas morning with his wife and kids. 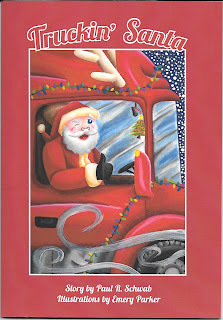 Upon seeing Santa and his crew, Nebraska Sam stops and ask if there is any way he can help Santa save Christmas. It does seem hopeless. But then Santa remembers something Mrs. Claus had packed in his sleigh and gets an idea of how he, and the trucker from Ohio, might still be able to get all those presents delivers, blizzard not wisstanding. Santa’s solution is brilliant and we won’t give it away. We’ll just say this is a truly sweet and charming tale perfect little ones just learning to read. The story is ingenious and fun and the art colorful to max. This is the kind of book any small child would love to have. Do yourselves a favor and pick up a copy and have it ready for next Christmas. It’s a gift all of you will cherish. It’s 1897 and the 19th Century is coming to an end. America, still rebuilding from the ruinous Civil War, is on the cusp of the Industrial Revolution. Things look bright for the future until mysterious reports of strange flying aircraft begin to filter into Washington. Staring from sightings on the west coast, these viewings begin springing up in an eastward route until they become weekly occurrences in the skies over America’s heartland. Unable to ignore the public’s fears as fueled by exploitation newspapers, two young men are sent to investigate different aspects of this phenomenon; Army Lt. Valiantiene and Treasury Agent Cabot. 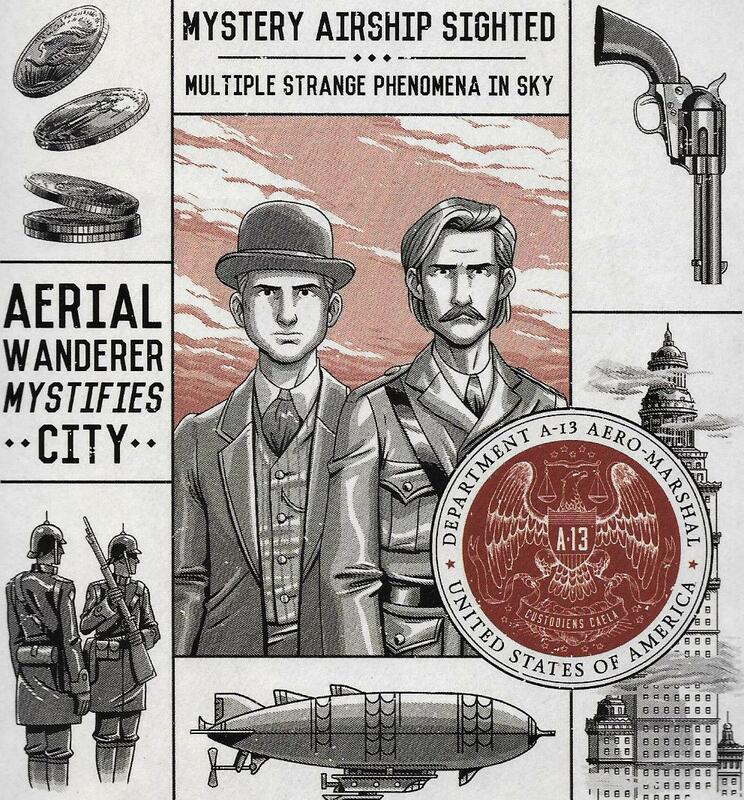 All they manage to uncover is yet more mysteries such as the appearance of strange, counterfeit gold coins in the vicinity of the airship sightings and the brutal slaying of innocent country people at the hands of monsters that tear their victims apart as if they were rag dolls. Can these beasts also be connected to the weird skyships? About this time, both men are introduced to each other and told they are to work together as the first operatives in a new branch of the Secret Service to be known as A-23 Aero Marshals. Up until this juncture, the book had been a straight mystery novel but once Cabot and Valiantine join forces, their burgeoning relationship adds the much needed fun part of the entire adventure and easily sets up the following series of events the two must content with and overcome. 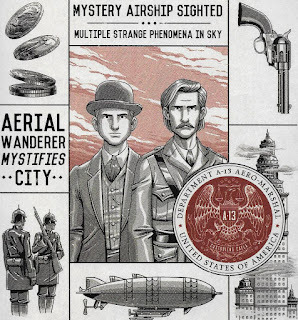 If we have one critique with “Airship Hunters,” it is that the publisher should have announced somewhere on the covers that this was only the opening chapter of a series and that the main mysteries that set everything in motion are actually not solved by the book’s end. Which is a minor cheat, but still a cheat. You see, we liked this introduction to Cabot and Valiantine and are eagerly going to be awaiting the next chapter of this saga regardless. We’d strongly urge you to join us. It takes a rare brand of imaginative courage to transform a famous American poet of the 19th century into a bonafide pulp detective and that is something author J. Aaron Sanders has in abundance. As an associate professor at Columbus State University with a PhD in American Literature, it is easy to understand Sanders familiarity with poet Walt Whitman. What is a revelation is his grasp of the times in which the writer lived and honed his skills to claim his cherished position in our cultural history. The year is 1943 and young Mr. Whitman is working as a journalist for a New York paper called the Aurora. Two of his dearest friends are Abraham and Lena Stowe, doctors operating a medical college for young women. When an unmarried girl is found dead from a botched abortion, the finger of guilt points to Abraham. But before he defend himself in count, he is murdered and his wife Lena found standing over his mutilated corpse. She is quickly arrested, tried and found guilty. Despite the fact she is pregnant with their child, the civil authorities fear a public riot and her death sentence is hastily carried out. Poor Whitman makes a foolhardy attempt to stop her hanging but in the end Lena Stowe is executed in this barbaric fashion before his eyes. From that point on, Whitman vows to uncover the truth behind the deaths of his friends. Who really killed the poor unwed girl and put the blame on Abraham? Who then butchered the innocent doctor and made it appear his own wife had committed the crime? It is at this point in Sanders tale that mores of the era come into play in regards to common practice of grave robbing to supply medical schools with cadavers on which their students could study. In the early 1800s society was unwilling to accept that only through clinical dissections could medicine advance. Zealot religious leaders saw autopsies as sacrilegious and believed if a body was dismembered after death, then the deceased would be incapable of resurrection as promised in the Christian bible; thus being eternally damned. Thus the body snatching business was a lucrative one for a callous breed of criminals trying to survive in an overcrowded metropolis filled with both disease and political corruption. Whitman, with the aid of an old editor friend, Henry Saunders, learns that Abraham had been advocating for a new Bone Law that would make it legal for medical schools to purchase cadavers. If enacted, it would end the illegal body snatching trade. He suspects that would have been cause enough to make his friends the targets of the criminal ring unwilling to see their illegal profits come to an end. Then, he and the female students of the Stowe’s school become threatened and the center of undue public scrutiny. Whitman’s inquiries have alerted the killers and they are not about to allow him to discover the truth, even if it means silencing the reporter and hurting those nearest to him. 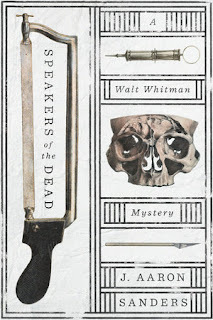 “Speakers of the Dead,” is a fast paced mystery to rank with the best this reviewer has ever enjoyed. Sanders effortlessly propels his protagonist through the streets of a past New York that comes to life in his prose. His characters are complex, vulnerable and brave Whitman emerges in a whole new light for those of us who struggled with his works long ago in high school. This is a Walt Whitman who is very much the symbol of a country undergoing growing pains and aspiring to be something ever grander than its origins. Pick up this book and get ready to be entertained to max.